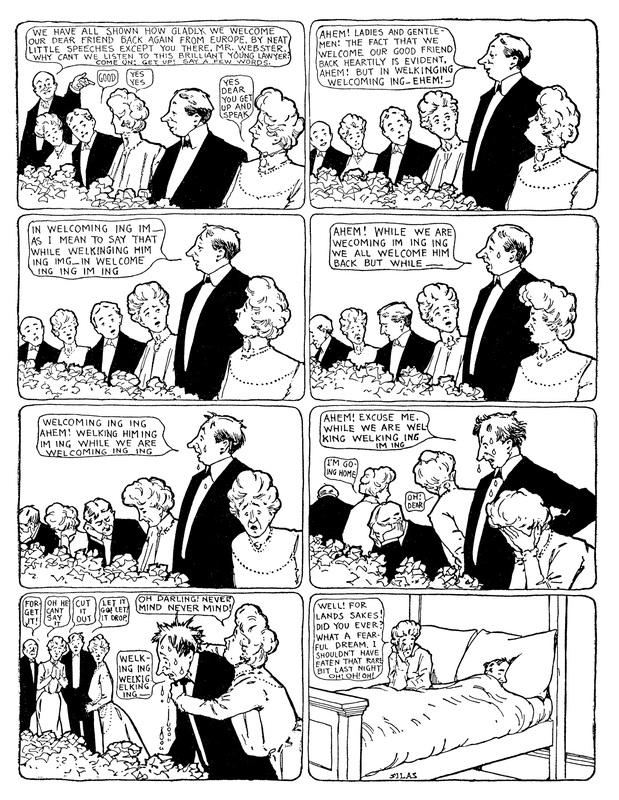 McCay wrote and drew the strip as an examination of the nightmares supposedly evoked by eating melted cheese sauce on toast just before bedtime. Stouffer’s sells a pretty tasty frozen version to this day (you have to provide your own toast, though). I don’t believe medical science has any recorded cases of cheese-caused night terrors, and none of the premise makes a lick more sense than Sammy Sneeze: someone has a nightmare, wakes up, and expresses remorse for their choice of late-night snack. But instead of the earlier work’s monotonous formula, he used this simple premise to eviscerate modern humanity’s deepest, darkest fears and display them to us like deer carcasses on a pickup hood. Here are two of my favorites. I intend to publish a few of these on an entirely arbitrary basis, with explanations of the more bizarre aspects of turn-of-the-previous-century society when necessary. First up is a fine illustration of the reason we’re afraid of public speaking. A brilliant young lawyer has some difficulty with a brief after-dinner speech. 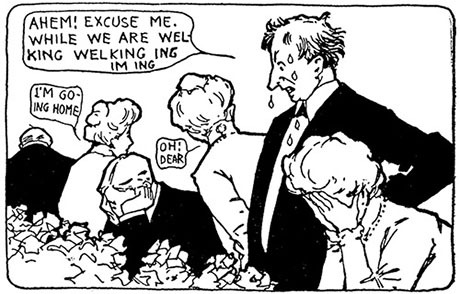 And here is a potshot McCay took at the Masons and other secret societies of the time. These “fraternal organizations” were usually a way to make business connections or provide life and injury insurance, but they took their rituals and initiations very seriously. 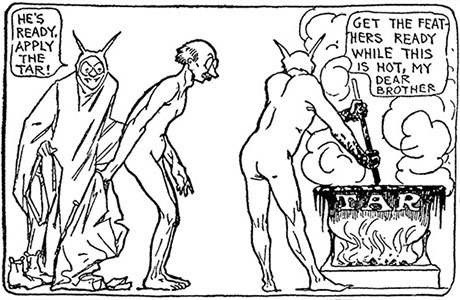 A man discovers to his dismay that the initiation secrets of his lodge are taken pretty seriously. Fred Flintstone and Barney Rubble belonged to one of these: The Royal Order of Water Buffaloes. Actually, you’d be surprised at how many of them still exist, although some are having difficulty finding new members to replace the older ones that Father Time sees fit to usher off this mortal coil.